The facility closing at the end of the year is using looms built in the 1940s (!) which uses shuttles like traditional looms. At 3 passes of through the warp per second they are clearly more technologically savvy than hand powered looms. They make a sturdier cloth than modern looms because the weft (horizontal fibers that are woven through the warp which are the vertical fibers) is continuous, it goes back and forth across the weft all the way through the cloth. 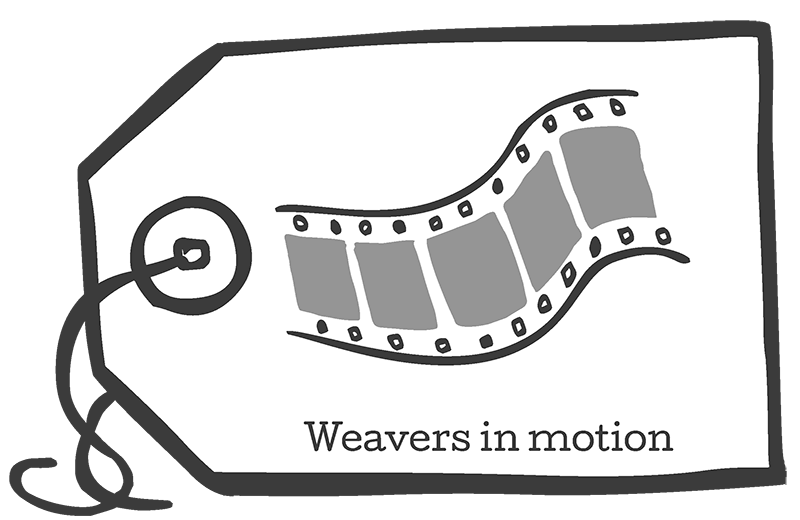 Modern looms cut the weft at the end of each pass (and use air jets to propel the fiber!) because the width of the loom is too wide to use shuttles. The other interesting aspect of these older looms is that the motion of the shuttles on a wood floor causes small imperfections in the weave that give the cloth a unique look that isn’t found in cloth produced on a “modern” loom. In addition, vintage jeans were also dyed with indigo plants (vs synthetic indigo) and only the warp threads are dyed to give the finished fabric that familiar worn blue color (blue warp, white weft). Primarily cheaper labor in other countries (Turkey) caused this plant closing. 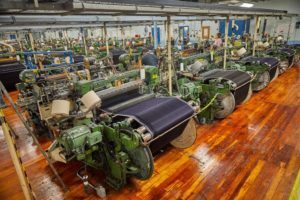 The looms (Draper X3 manufactured in Hopedale, MA) are being bought up by other small specialty startup mills so there is hope that they will some day be making quality cloth in the US again. 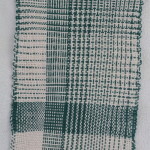 I’ve been weaving some samplers to explore techniques. Since my working looms are rigid heddle looms (a Mirrix tapestry loom and an Inkle loom) I’m focusing on using only two sheds. More intricate things can be done on these simple looms by adding pickup sticks but my poor vision makes me prone to threading mistakes so I’m working on getting the most out of simple methods. The sampler below explores color and weave. 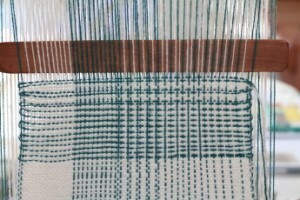 The patterns that can be created are nearly endless and use plain weave! 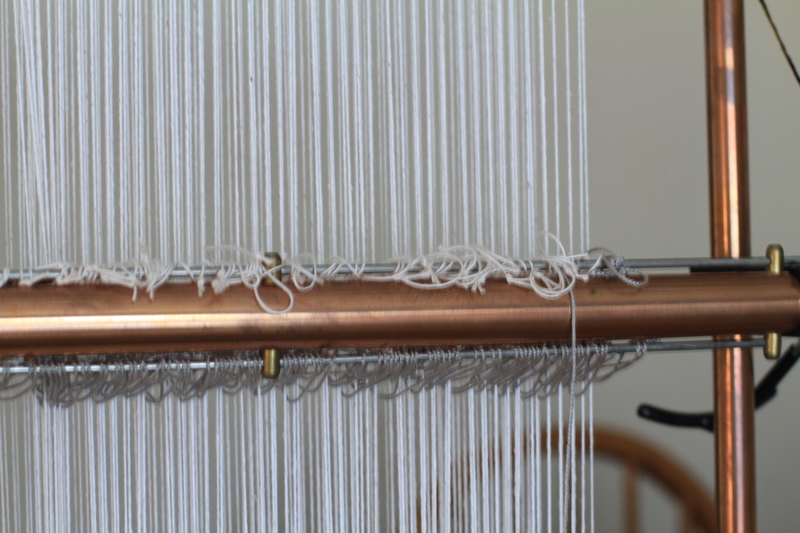 The trick is in threading the warp with a color sequence and then following the same for the weft. 20 ends white, 1 green 1 white 10 times (20 ends total), 2 green 2 white 5 times (20 ends total), 1 green 2 white 7 times (21 ends total), 1 green 3 white 5 times (20 ends). I also added 2 warp rows of green on each end for a selvage. 20 picks total of 1 green followed by 3 white. This produces 25 blocks of patterns (5 wide x 5 high). Initially I had a difficult time getting a good shed but after about 4 inches of weaving it finally started behaving. 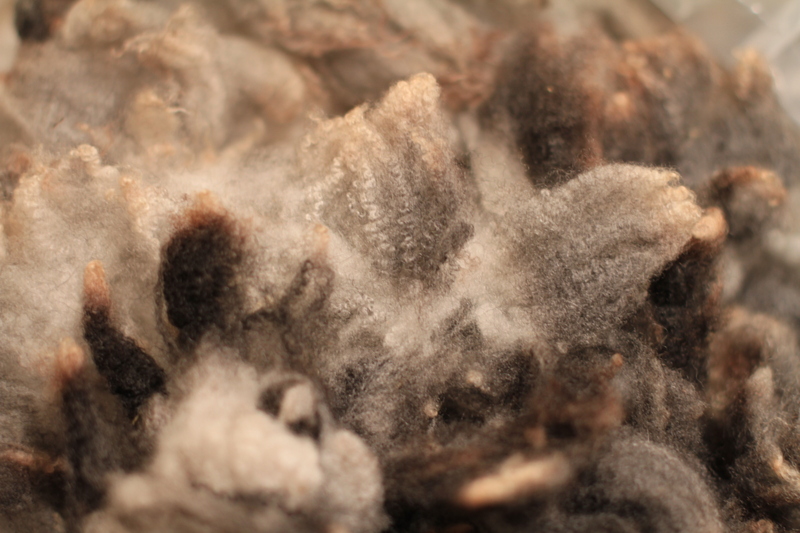 Wool is ‘sticky’ so it is tricky to use with a small epi in both warp and weft. Also, the green was not as strong as I would have liked so it was difficult to get good even tension across the warp. I made a few mistakes (!) 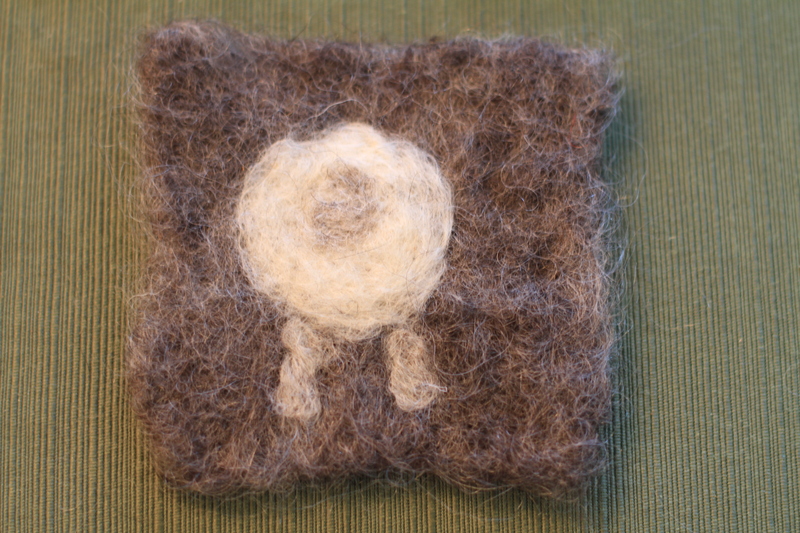 but it will make a great reference for future weavings. I finished it using twisted fringes, the first time I have ever used this method. 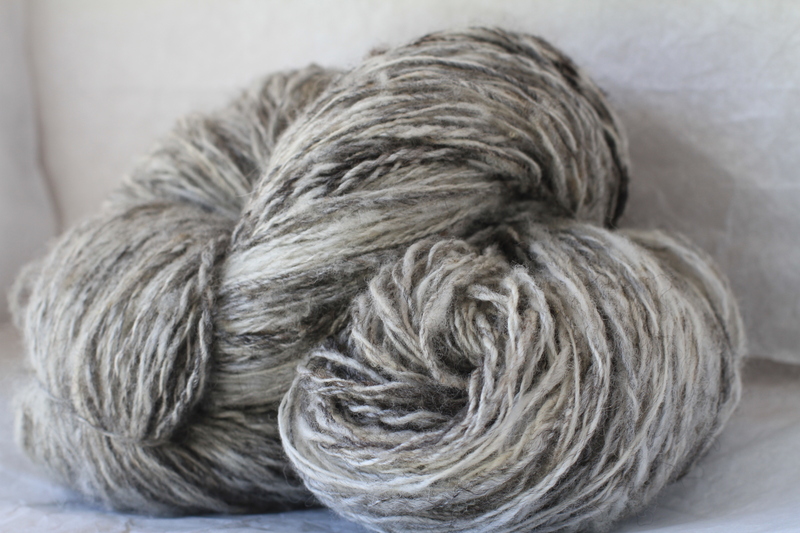 I bought a very economical fringe twister from Fiber Artist Supply. It made the job go quickly and it would have been difficult for me to do by hand due to my arthritis. In order to use up the rest of the warp on the loom (ie- not waste all that yarn and effort!) 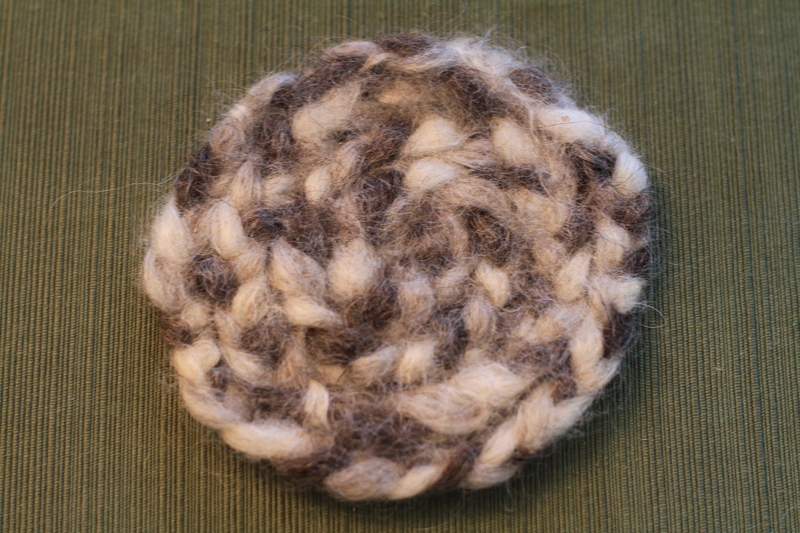 I created a Ghiordes knotted mini rug using BFL, Coopworth and Shetland fleece locks. It is done with all natural colors and so luxurious feeling. The length of the locks was quite different so the pile length varies. I did some trimming to remove “split ends” as I went along. 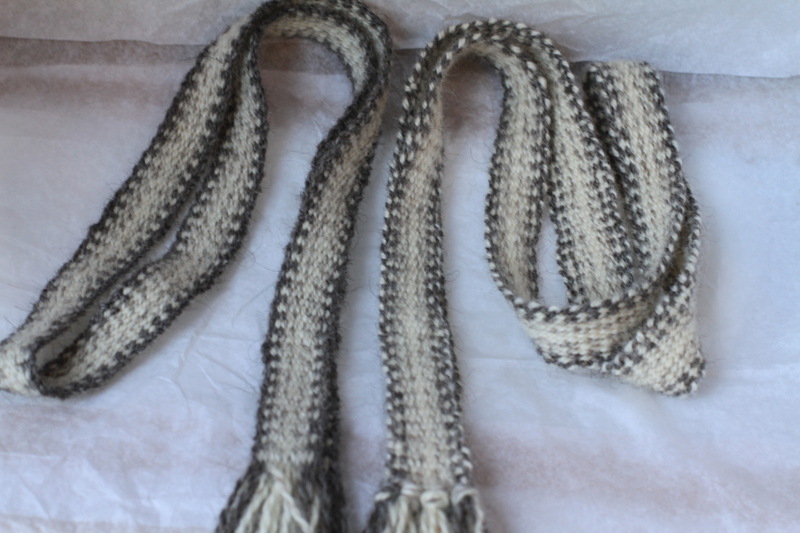 The edges have 2 plain weave selvedges to keep the rug laying flat and there are 4 plain weave rows between knots of the shorter BFL and shetland locks (~2 inches), 8 plain weave rows between the much longer coopworth locks (~6 inches). 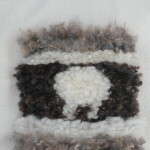 The most time intensive part of the project selecting evenly sized locks from the fleece and organizing them to be pulled up quickly while weaving. I’ll definitely do more of these on a larger scale. Just need to develop a design. One more item for the to do list!